Imagine coming across a “Home for Sale” listing on the internet. It’s in a neighbourhood you’re seriously considering. You and your family are excited. You can hardly wait to view the property and see if it could be your next dream home. When you contact the agent, she says the homeowners are busy people and won’t be able to show the house until next week. Even then, the only time available is at noon on Wednesday, when you’ll be miles away at work. How about viewing the property on Saturday? Forget it. The homeowners are having company over that day. Chances are, you’ll lose interest long before you ever get a chance to see that property! This may sound a little extreme, but it does illustrate an important point. If you don’t make your home readily available for buyers to view, many simply won’t view it, and your property may not sell. That doesn’t mean you have to be inconvenienced each day by a steady stream of buyers stomping through your property. However, you do need to be flexible. 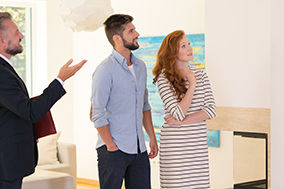 When buyers become interested in your home - by seeing the listing online, for example, they want to view it as soon as possible. The longer they have to wait, the more likely it is that another property will capture their interest. They may even make an offer on another home before they get a chance to see yours! That’s why as your REALTOR®, I’ll work with you to arrange the dates and times that your home can be shown - a schedule that’s convenient for you as well as for potential buyers.